“Not again, not again” were the only words I could utter when Vishal Santra called to share the news of Chirag Roy losing his life as a result of snake envenomation at Tadoba. I knew Chirag only through Facebook and a few common friends. I also knew that he was a mature person working in the field of wildlife for a long time and had considerable experience as a naturalist. I also heard that his death may have been due to anaphylactic shock – a reaction to the anti venom. I still don’t know what exactly happened. Whether it’s a mistake while rescuing the snake or mismanagement at the hospital by untrained doctors, either ways it’s a common scenario in our country, with the only difference being, this time it was disturbingly close to home! There have been many Chirags with maturity and experience who lost their lives in the past as well. Some of us may call it an occupational hazard and some may term it heroism or even martyrdom to cause. I will only say that it’s nothing else but plain tragedy. It shows disregard to one’s own safety, disrespect to the animals whom you are trying to conserve, and a complete lack of knowledge and information on part of the so called ‘naturalist tribe‘ which has flourished in India as a part of the adventure and wildlife tourism or the conservation bandwagon. I have already written about snake bite deaths in India in my earlier blogs (The Lost Frontier, http://kedarbhide.com/?p=1301 ) and too many snake friends losing their lives (The Rescue Paradox http://kedarbhide.com/?p=1483 ). So here, I just want to talk about how snake bite deaths are related to conservation and why do we need to give more attention to it. For the past few years, some of us have been trying to point out that snake bite is the most neglected human-animal conflict issue in India. It does not appear anywhere on the wildlife and conservation list, not does it appear on the human rights list and it’s completely neglected on the health and welfare list too. People from the field of wildlife, whose voice matters the most at the government and media level, don’t get time out of the tiger and climate change crisis to see other serious issues. People from the field of health, whose voice matters the most again at the government level don’t come out of the TB-Malaria-AIDS triangle even though there is one snake bite death to every two malaria or AIDS deaths in India. Am I saying this out of frustration? No not at all, these are plain facts. Show me one program on snake bite in media like NDTV tiger campaign, or show me one human chain or candle light meeting that has taken place for this issue as has been done for many other environment & wildlife issues. I think this may be mainly due to the uncharismatic and common characteristics of these snakes – Spectacled and Monocellate cobras, Kraits, Russell’s and Saw Scaled Vipers – whose venomation results in the estimated 50,000 deaths each year. I am saying this because last year there was a case of death due to ‘King Cobra’ envenomation in southern India, which was widely covered by all media and wildlifers. I think it was also trending on Whatsapp for a long time!!!!! The issue is of complete apathy towards a serious problem by majority of the opinion makers in the field of conservation and health. Either we have succumbed to those snake superstitions of our traditional folklore or we have accepted it as a fact of life. Today we are trying to create ownership of our forests with local communities. We feel that once the villagers, who reside around these tiger reserves, sanctuaries and parks start taking care of their forests, our efforts to save forests will be strengthened. And when you ask them what their biggest fear is with forests, you will find snake bite will be amongst the top three in majority of cases. What are we doing about it? In any of our plans on community participation for saving tigers as an umbrella species, do we include mitigation of death by snake bite as a confidence building measure at the community level? Will such mitigation measures find place alongside tree plantation, compensation for loss of livestock or electrification of villages? Possibly not, as human and snake deaths are not as directly linked as death of trees or livestock loss which results in a more obvious threat to survival of our umbrella species. All those corridor-protection talks and wildlife-out-of-protected-areas discussions again conveniently forget the biggest conflict happening in these areas is of snake-human conflict. People don’t want forest covers around their homes and farms because they think snakes will increase (which of course is not true). But such beliefs have already distanced them from forests and wildlife. Let’s keep aside what needs to be done at an organisational level, let’s talk about what role we as individuals can play – be it a wildlife enthusiast, conservationist, activist, naturalist, scientist or even a traveller while visiting these wilderness areas. Today snake bite is the only subject where possibly you and the local communities will find the same level of knowledge. This tragic death of Chirag makes this reality so stark that whether you are a top-of-the-ladder wildlifer or a local villager, both have the same preparedness when it comes to snake bites and envenomation issues. Today there are serious groups who are working steadily towards snake bite death mitigation in our country. There are expert doctors who are available on call to guide on the spot medical personnel on treatment. There are treatment protocols available at the national level. Whatsapp groups are available for awareness and guidance. How many of us know this and try to disperse this knowledge at the local community level or at the medical personnel level. What we need is the ‘be aware and make aware’ philosophy. There are some other complex issues like unavailability of anti venom or more specific is unavailability of the right anti venom and training of medical personnel on ground, which we are trying to address at an institutional level. What we are lacking is the collective wisdom and attention of our green community. May be we need to learn that in all our travels to wilderness areas, anybody of us can be a Chirag Roy and can lose life not because of snake bite but because of apathy/ ignorance of a serious problem, unpreparedness of yourself and the team with you and no capacity created at the ground level to address this issue. 3. Organize training programs for medical personnel in rural and wilderness areas on snake bite treatment. The people mentioned above can help you with that. Similar projects can be undertaken by interested people. 4. Create anti venom banks using conservation funds at forest department or other institutions at local level. Even NGOS/Resorts/Adventure Companies can keep a stock of Anti venom for any eventuality of their own people or for Local communities. One company always active to help is Premium Serums, http://www.premiumserums.com/ Dr. Khadilkar +919372828543, they can help you in supplying anti venom. Other companies who produce anti venoms are: Haffkine Bio-pharmaceuticals, Bharat Serums and Vaccines, Vins Bioproducts Ltd. Always think about the estimated 50,000 deaths and 200,000 loss of limbs resulting out of the largest human – wild animal conflict happening in our country !!!!!! Be Aware and Make Aware !!!!! You can Save Life !!!! Save Forests by saving the people around it !!! Excellent write up, just one suggestion would you please increase the size of font? It was quite eyestraining to read, plus white text on black background makes matters even worse. Its much better now. Compared to before, reading it on high resolution screen has improved a lot. Very well said about snake rescue, as well as humans being rescued from snakes. I appreciate your concern for the two i. e. snakes as well as humans. But today how much are we aware of snakes NGO’S what are they doing under the roof of snake rescuing. I am aware about a snake rescue team who rather than attending snake calls. what do they do. You say that y so many snake bites infact u have related to the ratio of 1:2 in comparison with malaria and AIDS today. If you wish to know how do they work drop me a message in my inbox. Hi. Very comprehensive. Very needed. 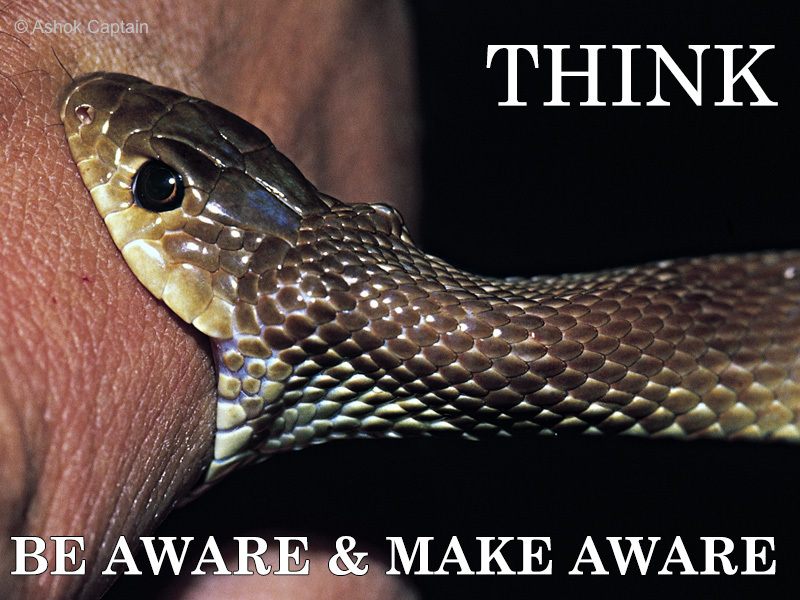 Another suggestion, if I may … Awareness programs – cities, villages, schools … Public awareness will surely make a difference … Fear of snakes needs to go. This will give way to respect and common sense. Both snake and man will surely benefit. A simple FB page is a great place to start. This is an idea I am giving you from being a member of Snakes of South Africa. I don’t even live there anymore. But the amount I have learnt from there is fantastic. Please check it out. Hi Swati, Our problem is not only fear of snakes but unprepared medical system to tackle snakebite situation, Unavailability of antivenom and general neglect of the situation. Awareness programs do help in conservation but doesnt solve our deaths problem. But Thanks for your suggestion, with your past experience you can surely starts similar efforts around your geography. Very relevant and to the point. Thanks for writing this. Worth finding out what lead to C getting bitten in the first place, and as you pointed out – actual cause of death. May seem mildly morbid, but it might help prevent repeat performances – either by rescuers, or docs. very well explained the whole scenario..
A informative write up..loved it.. and yes.. snake human conflict gets less attention by all.. unless its a King Cobra.. and snake rescue has became a passion now a days..just to get peoples attention and appreciation they do some unethical practice in handling snakes and that causes death. Not all the people out there who are seriously and sincerely work with snakes do that for people attention. The article was an interesting read, but it could have been extremely easy on the eyes if the colors and the font size were chosen wisely for the website. A common friend between us, always mentions that it’s always us and only us who meddle into the lives of snakes by handling them for “rescue”. I know many such cases wherein the “rescuer” thought it for the betterment of humans that the snakes be relocated. Has one thought of the reasons as to why in the first place the snakes got there! Another point that you hit the nail was about the first aid when one is bitten. The PHCs are just not equipped to deal with such things even if they have ASVs. Worth a thought to ponder over…. I really liked the article and am going to circulate it with your permission in more ways than just Facebook. Thanks Indrajit, you are free to circulate, no problems at all. Are you in Kolkata? Can we meet? This article is loaded with so many important points that actually every point is a topic for separate article. Offers good overview. I wonder why conservationists and health practitioners are not taking this seriously? Or have we internalized snake bites as reality of India for which we will shed two tears and move on with business as usual? or may be too many issues competing for attention and the less glamorous are left behind? but the statistics in this article clearly highlights need of the hour to address it. Thanks for sharing. Timely reminder for all the stakeholders on preparedness or rather lack of preparedness on the part of PHCs across India. Assessment of urgency to rescue is a criterion to be taken seriously. I appreciate the observation that human-snake conflict doesn’t find adequate representation in human -wildlife context. Well written and timely text. I’m going to share it across length and breadth of India. RIP Chirag. A very well written article and tribute to Chirag. What we need urgentl;y is not just the availability of anti venom but more so proper training to people in the field and the doctors on the dosage and administration of the same. I hope this incident leaves people with serious thoughts and translates into some solid work on the ground in terms of proper and comprehensive training. I personally have always wished to know more about it and would love to be trained to be able to help people on the ground. Thanks for voicing what many of us felt yet could never articulate effectively. One other point that I appreciated in Priyanka Kadam’s post on the SHE website post Chirag’s demise was of the carrying of i.d on the person of anyone who is attempting to relocate a snake clearly mentioning not just personal particulars and whom to be contacted but also medical allergies as well as contact details of one doctor specialising in ASV administration. Chirag had mentioned his hyperallergy issue to me thus there is a feeling in me that its very important for a treating doc to know the same. Thanks for sharing a very pithy write up that hopefully those working in the fields will take extremely seriously apart from educating the public. Thanks Smita, yes cards will be surely helpful. Can i suggest you to change the background form black to any other colour? Its quite straining .. Very good article and quite well written with all possible facts and issues. Our Range Officer (already a double kidney transplant patient) was bitten by a young Mountain Pit Viper three days ago. Apparently he shd hv got 10 vials pf antivenom within the 1st hr, is what the doc at Manipal hospital here said. He got only two through the day at the local hospital, and is in critical condition still. Kedar, your writeup is really good and I will share with others here in Sikkim. We need regular sessions on this during our refresher courses for frontline foresters. Very good Blog Kedar. Identification of snakes at local levels is a big issues. Even doctors at the primary health centers are unable to identify, which makes it very difficult for the treatment. Hi Nikhil, You dont need to identify snakes for treatment. There is only one polyvalent antivenom and treatment need to be symptomatic and not snake specific. I came to know about blog by like given on your FB post by common friend. Your posts and pdf provide great information.We live in area where farm is right at the back side of house, and seeing venomous/non venomous snakes is a common practice. Can you also give information about the police case that needs to be reported on snake bites? Does the victim need to be present at police station while registering case?Do the doctors treat first and then ensure a police case presence or they donot touch patient without a police case proof? In such case how patient will survive as typically person dies within 1 hour of venomous snake’s bite? Thanks for answering these, if you get time to answer. As per IPC, most animal bites are police cases including dogs. Generally nobody stops treatment for reporting to police station. The police representative at Govt. Hopsital takes care of reporting. Private hospital many times refuses patients as Anti venom is not with them and available at Govt. Hospital. There may be some private ones refusing due to Police reporting but that has gone down nowdays. Very alarming news about Snake-Human conflict. The blog also cautions all the wildlife enthusiasts to be careful while in field work and also to improve upon the knowledge of self protection. just pursuing career as Naturalist is not enough,one has to be perfectionist too. May all such workers be cautioned time to time to stay safe and alert. An excellent write up sir….hatsoff….a very grave issue that we are so ignorant about at root level!!! Hello Kedar Sir. This is actually one of the most informative article on Snake bite awareness I have ever come across. True and alarming situation. Honestly, being fascinated with snakes for so many years , I did not much divert my attention to the graveness of snake bites and the deaths by it. I guess this article and its underlying perspective will definitely aggravate my knowledge and helpful for people in our profession. It is very depressing to know about the tragic deaths which otherwise could have been avoided with correct and available treatment. But with these highlights it is a need to onset a change. c) in a long-term plan, make snake-bite treatment a compulsory subject in medicine so every new doctor gaining his/her MBBS degree has the knowledge. Are there many kinds of anti-venoms? Is the storage method for all the same (i.e is refrigeration required)? So much can be done. You have made a great contribution with this article. Hope you can take it forward. Will reply you in detail by email. Hello i m from gandhinagar the capital city of gujarat. very usefull informations. i also work as snake cacher. i jst work to save animal birds rescue social work. i want more knowledge about all rescue work.